Few people have had as great an impact on the modern environmental movement as has the great writer and scientist Rachel Carson. This readable and up-to-date biography traces the famous environmentalist's development as a writer from earliest childhood through the publication of her best-known work Silent Spring (1962). Although Carson is now remembered almost exclusively for Silent Spring, which exposed the dangers of pesticides, this book was preceded by three best-sellers about the ocean environment: Under the Sea-Wind (1941), The Edge of the Sea (1955), and The Sea Around Us (1951) which catapulted her to fame. 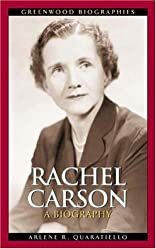 In Rachel Carson: A Biography, Carson emerges as a talented scientist and exceptional writer who was able to share her sense of wonder about nature with both scientists and the general public. Carson's great love of both writing and nature emerged at a young age and enabled her to overcome numerous obstacles in her life. She made a critical decision to switch her major in college from English to biology, she suffered financial problems during the Depression, and family and work responsibilities left her little time to write. She struggled for years to become a writer, working in relative obscurity for 15 years at the U.S. Fish and Wildlife Service writing pamphlets and brochures. She also endured harsh criticism of Silent Spring toward the end of her life while terribly ill. This biography shows how Carson overcame these difficulties and persevered to become one of the most influential writers of the last half of the 20th century. Her legacy as a champion of nature continues 50 years after her death. About Arlene R. Quaratiello (Author) : Arlene R. Quaratiello is a published author of children's books. Published credits of Arlene R. Quaratiello include Rachel Carson: A Biography (Greenwood Biographies).